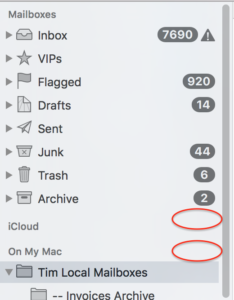 Are you missing your email folders in Apple Mail? Did these folders disappear after you upgraded your Mac’s operating system or after you migrated your data to a new Mac? If so, there’s likely an easy fix. Apple added a Show/Hide button to Apple Mail. I believe they added it to Mail starting with OS X Lion (aka OS X 10.7). This button can be used to either show your mail folders or to hide them. This button can be quite vexing because this button is not visible all of the time. In fact, it’s invisible by default. It only becomes visible when you move your cursor on top of it. The red ovals in the image to the right show where this Show/Hide button is located. In the image you can see that the mail folders in my On My Mac section are currently displayed. Thus, if you move your cursor to the circled area you’d see a Hide button. If you click this button your folders would disappear. Similarly, the mail folders in the iCloud section are currently not displayed. If you moved your cursor to the circled area you’d see a Show button. The image to the right shows you what the Show button looks like. If you ever discover that all of your mail folders have vanished, please locate the Show/Hide button and click on it to see if your folders magically re-appear. If this is not the solution to your problem, then please quit and re-open Mail since this can also sometimes help folders re-appear. Read more about Apple, disappear, folders, hidden, Hide, mac, Mail, mailboxes, show.